You’ve already seen a preview from Anamika Khanna’s Summer/Resort collection. Here is the look at the rest that followed the menswear inspired looks. Although the collection was predominantly black and white, there was also some color injected by way of lehengas, kurtas, dupattas. All of the looks were rich in the trademark Khanna-esque embellishment. It probably is just me, but some of the looks took me back in time to the Gandhi-era where white used to be the theme and full-sleeve blouses were seen with full skirts. The collection did feel a wee bit phoned in (the ill-fitted jodhpurs/the cholis) but the richer individual pieces more than made up for it. We, of course, were gushing over the pink lehenga and the embellished vests. love it. she did a good job in this collection. 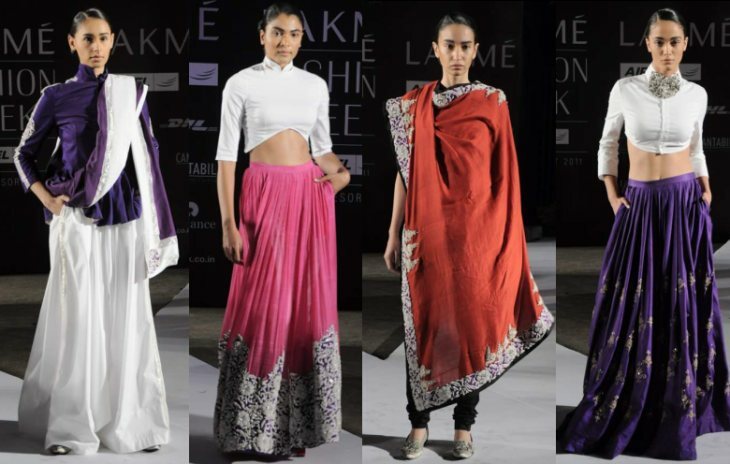 I like, especially the white kurta with black short jacket and the long skirts in pink and purple. I like them, except everything comes with high necks.. I can’t handle high necks, especially in Indian weather, but that’s prolly cuz I don’t live there..